From 400TVL line analog cameras to 40MP IP ones, surveillance users have a vast range of options. But which ones are most commonly used today? 138 integrators responded to an IPVM survey asking them this exact question. Megapixel is here, not just in theory or marketing, but actual deployments. SD is becoming increasingly rare. Within megapixel, integrators are roughly split between 720p / 1.3MP cameras (49%) vs Full HD / multi-megapixel ones (44%). That, in itself, represents a shift over the last few years as manufacturers have expanded their 2MP+ camera offerings. We expect to see this continue with more deployments moving to 1080p or higher in the next year. 5MP+ cameras are still uncommon. 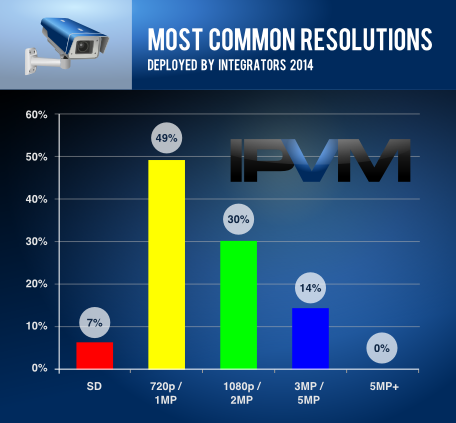 The 0% showing in the survey means that none of these integrators used 5MP+ as their most common choice. However, certainly some 5MP+ cameras are being used. This is still being restricted by supply (i.e., not many manufacturers offer 5MP+ cameras), quality (e.g., low light, WDR problems) and cost concerns. New 4K releases will add supply (as they will offer 8MP and, often, 12MP max resolution) though we believe adoption will be limited in 2014 and 2015 (covered in our 2014 trends report).